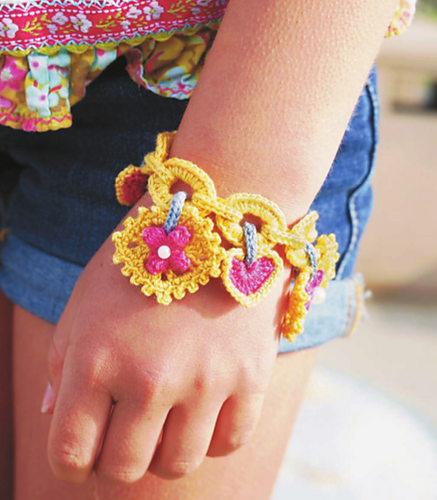 One of my favorite patterns from the book is the "Charming Bracelet". I love vintage jewelry, and charm bracelets are something I have always collected. I was especially inspired by a 1950's heart themed bracelet I found in my research. The idea of making a crochet version was so exciting to me, I couldn't wait for it to be in the book! It is a design that I feel really shows my personality. One of the benefits of a crocheted charm bracelet is that they are lightweight and quiet! I could never wear my vintage charm bracelets when I was in school, because they made so much noise, especially when erasing! This bracelet can be worn anywhere, and is sure to be a conversation piece when you do! You could also simplify it by only making the Large Charm. I have a few vintage bracelets in this style that I adore. It would bring more focus to the details in the charm. I used Universal Garden 10 thread for the book sample. It is great for jewelry, as it has has a slight sheen and comes in a range of beautiful colors. One very important detail in making crochet jewelry is the blocking. I blocked this bracelet twice. The first time, the individual elements were blocked (the linked bracelet, and each of the charms). The second time, the bracelet was blocked after all of the charms had been attached to the bracelet. 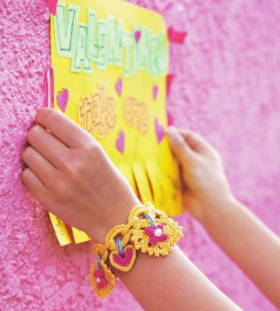 If you make this bracelet, please don't skip this step, it is the finishing touch! Stay tuned, tomorrow I will be posting a way to use this pattern for adults! new to the site where get this pattern and one for the adult. A Great Time to Buy Crochet Patterns! Crocheting Clothes Kids Love Book Giveaway!